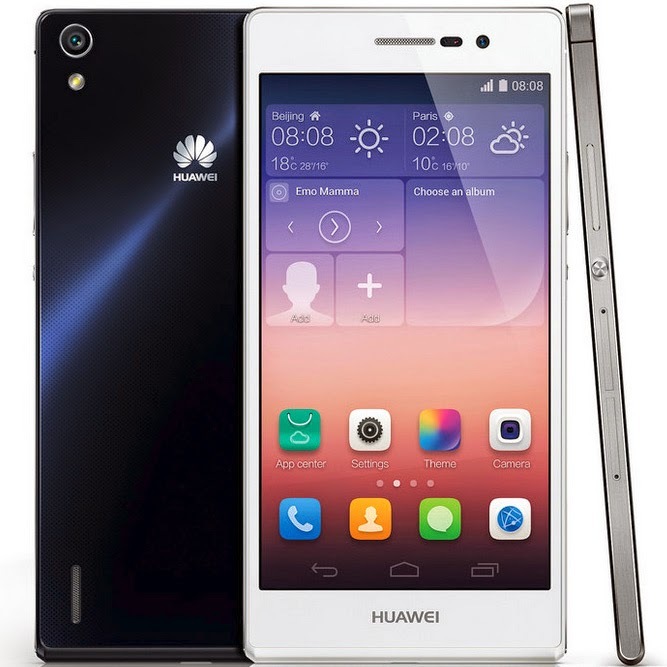 The stylish and sleek Huawei Ascend P7 was officially announced today during a press event in Paris. This Android powered flagship smartphone is the successor to last year's Ascend P6, which was formerly the world's slimmest smartphone. While the newer model doesn't set a new record for thinness, it is still a beautiful device with a slim 6.5 millimeter (0.25 inch) waist. 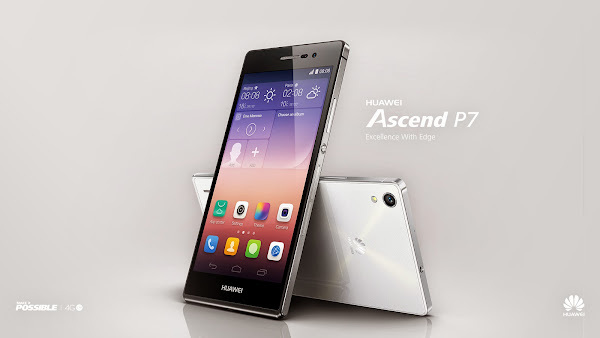 Just like the Ascend P6, Huawei has used premium materials to build their newest smartphone. 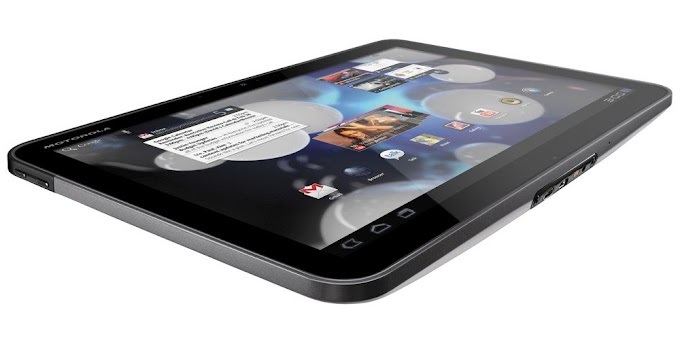 A metal rim surrounds its sides while the front and back are both made of Gorilla Glass 3. 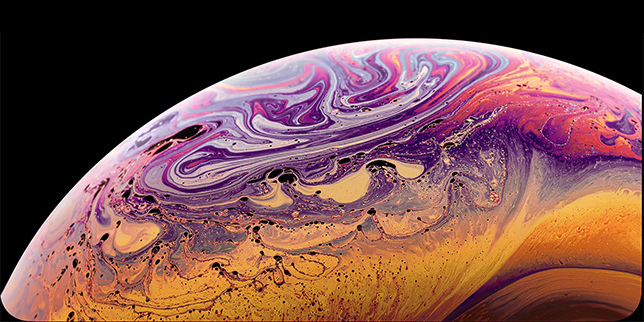 At the same time, it weighs only 124 grams, which makes it very light for its size. The device comes with a 5 inch in-cell LCD display with a resolution of 1980 by 1080 pixels, which results in a pixel density of 445 ppi, which is quite acceptable for an Android flagship device. You can 16GB of onboard storage for your content and a microSD card with support for as much as 32GB if you need more space. Connectivity-wise, the Huawei Ascend P7 supports LTE at theoretical peak speeds of up to 150Mbps. And when LTE is not available, you'll be able to get online with the phone's HSPA+ radio instead. Wi-Fi, GPS, NFC, and Bluetooth 4.0 are all on board as well. In terms of battery life, you get a respectable 2500mAh lithium-polymer cell, which promises 14 hours of talk-time on 3G and up to 400 hours on standby, even if you are connected to a 4G network. Huawei also promises that the device has a quick charge time, allowing the battery to charge from zero to 100 in just 3.5 hours. On its rear you will find a 13 megapixel camera with LED flash which promises to take amazing photos. The sensor is a 4th generation unit from Sony which has a f2.0 aperture, and 5-element lens. On its front is another 8 megapixel camera with a 5-element lens system and a feature called "Panorama Selfie" which will clearly be useful in a future Twitter record breaking situation. The Huawei Ascend P7 is powered by a HiSilicon Kirin 910 SoC with Mali 450 GPU and a quad-core CPU clocked at 1.8GHz. While this chip may not be comparable with something like the Snapdragon 801, it has proven to be a decent performer on benchmarks and can be as capable as a Snapdragon 600 powered handset. You also get 2GB of RAM on board, so you should have no problems keeping a bunch of apps loaded in memory for smooth multitasking. 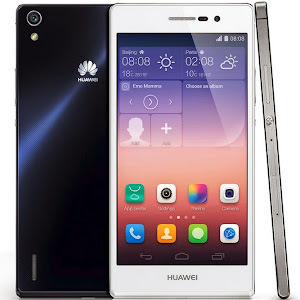 On the software side, the Ascend P7 runs Android 4.4 KitKat (4.4.2) which has been customized with Huawei's Emotion UI version 2.3. You get support for UI themes, lock screen shortcuts, a bunch of new widgets, toggle buttons in the notification panel, and a lot more as exclusives from Huawei. You also get some great value added features like a Harassment Filter to block unwanted contacts, a Do Not Disturb mode, a built-in virus scanning solution, a power saving mode, an ad blocker and a notifications manager. The device will be available in black, white and pink and is set to cost around 450 euro (~$626) which is a decent asking price for a great-looking smartphone with a high-quality feel.